From 2006-2009, I wrote an annually updated article for this site called “Jews who Wrote Christmas Songs,” that was based upon the American Society of Composers and Publishers (ASCAP) list of the top 25 holiday songs of a given year. The ASCAP list (then and now) is determined by a song’s radio airplay on over 2,500 monitored stations. It only includes songs under copyright (in other words, no traditional carols). I took this annual list, which most people would refer to as Christmas songs, and told you which of the songwriters were/are Jewish or from interfaith backgrounds, and which of the musicians who played the most popular version of the song were/are. In 2010, ASCAP changed their procedure and issued only a top ten list (top ten holiday songs, judged by radio airplay, as of mid-December). Last year, ASCAP also issued a top ten only list. This year, ASCAP issued their top ten holiday song list on December 12. Two years ago, for the first time, I also annotated Billboard magazine’s “hottest” 30 holiday songs. As with the ASCAP list, I told you which of the 30 songs were written or co-written by Jewish composers and if any of the most popular performers of those songs were Jewish. In 2011, I did the same thing, but limited myself to just the top 25. Again, this year, I am annotating the Billboard list of the top 25 holiday songs (for the week ending December 22, 2012). Billboard ranks songs based on radio airplay and sales (hard copy and downloads). I’ve added some music videos of the songs on these lists. Almost all the performers in these videos are/were of Jewish or interfaith background or were long married to a Jewish person. Near the end of this article, I note a new record collection that features Christmas/holiday songs sung by Jewish singers and Jewish songs sung by non-Jewish singers. Also included is a brief description of, and links to, reviews of a new book, A Kosher Christmas: ‘Tis the Season to be Jewish, by Rabbi Joshua Eli Plaut. It is a comprehensive historical study of the interaction of American Jews and Christmas (and references InterfaithFamily’s December Holiday surveys!). Also near the end of this article, the video of the quite funny Saturday Night Live musical number, “Christmas Time for the Jews,” which Rolling Stone magazine, in an ecumenical touch, named one of the top 16 Rock and Roll Christmas Songs of All-Time. Finally, at the close of this article, a brief biography of Eddie Pola, the lyricist who co-wrote the perennial holiday favorite, “The Most Wonderful Time of the Year”. I have long suspected that Pola was Jewish. However, biographical information on him was very scant and I could not confirm whether he was Jewish. Fortunately, I was able to find and correspond with his daughter and she was kind enough to provide me with a short biography of her Jewish father. This song was #1 in 2011. Here’s an unusual version of “Sleigh Ride” performed (1965) by the famous “surf sound” instrumental group, the Ventures. The drummer on this version is Mel Taylor (1933-96), who was with the group almost from 1962 until his death. The son of a Jewish mother and a Protestant father, he identified as Jewish. His son, Leon Taylor, replaced him in the group and is still the Ventures drummer. This song was #2 in 2011. This song was #4 in 2011. Video performance is by the late Lena Horne (1917-2010), the famous African-American singer. She was married to Jewish music conductor and composer Lenny Hayton (1908-1971) from 1947 until Hayton’s death. This song was #10 in 2011. Not in the top ten in 2011. This song was #7 in 2011. This song was #3 in 2011. Here is a video of Mel Tormé, who was Jewish, singing “The Christmas Song,” with Judy Garland (who wasn’t Jewish) on the Judy Garland Show in 1963. This song was #5 in 2011. This song was #8 in 2011. Appearing on the 2011 ASCAP list, but not on the 2012 list: “It’s the Most Wonderful time of the Year” (#6 last year) and “Rudolph, the Red-Nose Reindeer” (#10 in 2011). Both these songs do appear on the 2012 Billboard “Hot 25” holiday songs. No doubt, if ASCAP still had a “top 25” list, they would appear somewhere not much below the top ten. If you are keeping score, note that 6 out of 10 of the top ASCAP holiday songs of 2012 were written or co-written by Jewish songwriters. As for performers, while Bruce Springsteen (“Santa Claus is Comin’ to Town”) is not Jewish; two of his band members, drummer Max Weinberg and keyboardist Roy Bittan, are Jewish. Harry Connick, Jr. (“Let in Snow, Let it Snow, Let it Snow”) is the son of an Irish Catholic father and a Jewish mother. His mother died when he was 12, and, not long after, he decided to practice his father’s faith and has long been a practicing Catholic. None of the other performers of the “most popular version” of the above songs, are of Jewish background. Also in 2011, I wrote a long article on Robert May and Johnny Marks for InterfaithFamily. May wrote a poem in which he created the character of Rudolph the Red-Nose Reindeer. This poem was turned into the song of the same name by Johnny Marks, his brother-in-law. 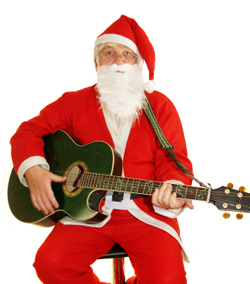 Marks also wrote the holiday favorites “Rockin’ Around the Christmas Tree” and “A Holly Jolly Christmas”. The article, “Shining a Light on the Largely Untold Story of Rudolph the Red-Nosed Reindeer,” contains biographical material not found in any other source — I think you will find it interesting. This song was #1 last year. Neither Carey nor Afanasieff, her long time collaborator, is Jewish. However, Jewish musician and songwriter Kenny G was the best man at Afansieff’s wedding. (Kenny G’s version of the holiday favorite, “Silver Bells,” is a perennial best seller). This song was #4 last year. As noted above, and in previous articles, Marks was Jewish. As noted above, Tormé and Wells were Jewish. This song was #6 last year. As noted in previous articles, I don’t know much about these songwriters beyond the place and dates of their births. This was the only hit for these songwriters. Helms isn’t Jewish. This song was #7 last year. Marks was Jewish. Ives wasn’t Jewish. This song was #8 last year. Williams, who died this year, wasn’t Jewish. As noted above, Wyle was Jewish (he was born Bernard Weissman). Also as noted above, this year, for the first time, I was able to confirm that Eddie Pola (1907-1995) was Jewish. Below this list is a biographical sketch of Pola. The linked video is a charming acoustic rendition of this song by jazz guitarist and music composer Adam Levy and Jill Sobule. Levy, the grandson of Wyle, was in Norah Jones’ band at the start of her career and stayed in the band for six years (2001-2007). Then he decided to strike-out on his own as a singer/songwriter and sometime journalist. Like Levy, Sobule is Jewish. A folk/pop singer, she is still best known for two songs she wrote in 1995 for the film Clueless (“I Kissed a Girl” and “Supermodel”). At the start of the video, both Sobule and Levy note that Levy’s grandfather wrote “Most Wonderful Time.” I spoke to Levy back in 2006, and he had very fond memories of his grandfather. This song was #5 last year. This song was #10 last year. As I noted in previous versions of this article, I am virtually certain, based on a magazine profile, that none of the four members of the Trans-Siberian Orchestra are Jewish. This song was #13 last year. Bing Crosby wasn’t Jewish. Berlin was Jewish. Last year, for the first time, “White Christmas,” the most recorded Christmas song of all time, failed to appear on the ASCAP top ten list. I speculated that the reason was probably that Bing Crosby had become “an ancient figure” to many younger people and there was no other version of the song by a more contemporary singer that got a lot of airplay. But maybe not. Last year, “White Christmas” was #13 on the Billboard list, and this year the Bing Crosby version is in their top ten. In 2009, I wrote a long article about Berlin and his interfaith marriage for this site (“Irving Berlin, Elin McKay, and White Christmas”). It goes into some depth on the creation of this song. One of Barbra Streisand’s biggest sellers of her career is “A Christmas Album” (1967). It’s sold more than five million copies. I believe her performance of “White Christmas” is one of the loveliest I’ve ever heard. It includes the original first verse which is not included in the Crosby version or most other versions. It adds something fresh to the song. Streisand, as almost everyone knows, is Jewish. Surprisingly, last year it wasn’t on the Billboard list. Michael is not Jewish. There is a story on the internet that his mother is Jewish. This story is in error. Available biographical records conclusively show that Michael does not have a Jewish mother (or father). Last year (2011), a person responded to this same sentence by leaving a comment that noted that Michael has, at least once, said his mother is Jewish. It is true. Michael has said his mother is Jewish. But it isn’t true that his mother is Jewish. I will just add this: without being bogged down in links to detailed ancestry charts, all of these charts show, on his mother’s side, English, non-Jewish ancestry stretching back centuries. For whatever “weird” reason, Michael is making a fanciful claim of a Jewish mother. I don’t know the reason Michael said what he did. This song was #9 last year. This song was #18 last year. I know little about these obscure songwriters (Hayes and Johnson). Presley was not Jewish. Yes, some sources repeat a tall tale that Presley’s third cousin told 20 years ago to a Jewish biographer of Presley. This cousin said that he and Presley shared a very remote Jewish maternal ancestor (a woman who lived in the early to mid 1800s). A detailed check of available records, including the census, shows that this maternal ancestor was not Jewish. Presley and his parents did share a two-family house in Memphis, Tennessee with a poor Orthodox rabbi and his family in the early ’50s. I spoke to the adult daughter of this rabbi. Sadly, her father, the rabbi, died young. She was a child at the time of his death and she never talked to him about Elvis. She told me that her mother, the rabbi’s wife, and Presley’s mother, Gladys, were close friends. Gladys, her mother told her, never said a word about any Jewish ancestor. Her mother said that if Gladys had any knowledge of any Jewish ancestor, the mother was sure Gladys wouldn’t have hesitated to mention it. Presley worked for the rabbi’s family, doing tasks Jews were not permitted to do on the Jewish Sabbath. He did this for free. The rabbi, in turn, did things like lend Presley his record player and arrange for a summer camp trip for Presley. When Presley hit it big, he made a major donation to the rabbi’s religious school. As I often tell people, the true story of the lovely relations between this rabbi’s family and the Presley family is a more important and meaningful story than a story about Presley having a remote Jewish maternal ancestor. This song was #12 last year. Lennon was not Jewish, nor is Ono. This song was #21 last year. See #1, above, for songwriters. Michael Bublé is not Jewish. This song was #14 last year. Autry wasn’t Jewish. As noted above, Marks was Jewish. 17. Do They Know It’s Christmas? This song was #25 last year. Geldof, who was raised Catholic, has one Jewish grandparent. This song was not on the list last year. The former Beatle is not Jewish. His first wife, American photographer Linda Eastman McCartney, to whom he was married from 1969 until her death in 1998, was Jewish. McCartney adopted her daughter from a previous marriage and had three other children with Eastman, including famous fashion designer Stella McCartney. His third wife, American business executive Nancy Shevell, to whom he was married in 2011, is Jewish, too. This song was not on the list in 2011. Guaraldi, an Italian-American who was not Jewish, was a jazz musician and composer who wrote this tune for A Charlie Brown Christmas, an animated Peanuts TV special that first aired in 1965. Guaraldi died suddenly, at the age of 47, in 1976. This is another very popular song from A Charlie Brown Christmas. The original version that played in the cartoon special was co-written by special producer Lee Mendelson, now 79, and Guaraldi. Mendelson, who is Jewish, wrote the lyrics and Guaraldi wrote the music. Mendelson discovered Guaraldi when he chanced to hear a Guaraldi tune on a car radio and invited him to score a documentary he was doing on Charles Schultz, the Peanuts’ creator. A couple of years later, Mendelson obtained Schultz’s permission to do A Charlie Brown Christmas and enlisted Guaraldi again. However, the version charting on the Billboard list this year is the instrumental-only version as performed by the Vince Guaraldi Trio. Carey, as noted above, is not Jewish. Greenwich, who identified as Jewish, was the daughter of a Jewish mother and a Catholic father. She died in 2009, age 68. She began writing songs with Jeff Barry, now 74, in 1959 and they married in 1962. Barry is Jewish. The couple divorced in 1965. Together, they wrote some of the biggest hits in rock history. Many were produced by Phil Spector and some were co-written by Spector, like this song. Spector, now 72, is Jewish, too. The great African-American singer Eartha Kitt (1927-2008) was not Jewish, but she was a big supporter of Israel from the 1950s on and a great friend of the Jewish people. In 2010, the Idelsohn Society for Musical Preservation, a volunteer-run non-profit, released a CD called “Black Sabbath: The Secret Musical History of Black-Jewish Relations.” It featured 15 Jewish songs sung by many great African-American singers, including Kitt. These recordings represented a part of the cultural interchange in America that included Jews writing Christmas songs. Zeeman is now 84, but is still active enough to have a lively Facebook page. She is the niece of the late Jacob K. Javits, who served several terms as a liberal Republican U.S. Senator from New York. Like her uncle, Zeeman is Jewish. Zeeman, the mother of five, was also a playwright. “Santa Baby,” oft called one of the sultriest Christmas songs of all-time, was her only big music hit. Philip Springer, who is about the same age as Zeeman and also Jewish, also maintains a very active Facebook page. In a 2008 interview, Springer said that he and Joan wrote the song, specifically, for Eartha Kitt. The copyright for the song was owned by a publishing company and not by Springer and Zeeman. In 1981, the publishing company copyright expired and the rights to the song reverted to Springer and Zeeman. However, except for Eartha Kitt, no other famous singers recorded the song and interest in it died out by 1981. Springer tried, from 1981 to 1988, to get some famous singer to record it and, in the interim, Zeeman sold her half-share rights to the song to Springer. Then, in 1988, Madonna recorded the song and not long after, it was heard in the hit movie Driving Miss Daisy. The song then became a hot commodity again. As Springer proudly notes on his Facebook page, Michael Bublé included it on his 2011 Christmas CD and that album has just been Grammy-nominated. So, late in life, “Santa Baby” became a big financial Hanukkah present for Philip Springer. Good for him. Williams’ record, recorded in 1963, is actually a medley of two songs: “Happy Holiday” by Berlin and “The Holiday Season” by Thompson. “Happy Holiday” was written for the 1942 movie Holiday Inn, starring Bing Crosby and Fred Astaire. As detailed in my 2009 article, “My Top Five Christmas Movies with Major Jewish Connections,” the movie’s premise was that Crosby ran a hotel that was only open on major holidays and each holiday had its own musical number in the film. This song was actually sung in conjunction with the New Year’s holiday scene, but it has come to be associated with Christmas. “White Christmas” was the song sung on Christmas in the film. Berlin, as noted above, was Jewish. Thompson (1909-1998), a writer, musical performer, singer and songwriter, is now most famous for writing the Eloise series of children’s books. She made one major film appearance, in the 1957 Fred Astaire musical film Funny Face. “The Holiday Season” was written in 1943. Thompson, according to a full-scale book biography by Sam Irvin (Kay Thompson: From Funny Face to Eloise), was born Kitty Fink in St. Louis, the granddaughter of a Norwegian Jew, Mark Fink. Mark Fink married an Austrian Christian, Antonie Steiner, in Europe and immigrated, with Kay’s father, Leo, then 12, to America in 1886. Leo, Irvin writes, “buried his Jewish heritage,” and married a “WASP” American woman. Kitty/Kay was raised Protestant. She assumed the stage name Kay Thompson in 1931. I doubt that most contemporary Americans even know what Irving Berlin looked like. I searched in vain for a video of him singing “White Christmas.” Since Berlin, in some sense, holds the title of “King of the Jewish Christmas Song Writers,” its worth including the only good quality video of him on the internet singing a song. Here he is singing his tune, “God Bless America,” on TV in 1968. He was then a few days shy of his 80th birthday. He is supported by a chorus of Boy Scouts and Girl Scouts. The royalties to this song have always gone to these organizations. Berlin barely could carry his own tune, but his sincerity is obvious. The Burl Ives’ version of this song is #5 above. This song was #20 in 2011. Fred Coots, I confirmed a couple of years ago, was not Jewish. I am virtually certain that Gillespie was not Jewish, either. Again, if you are keeping score, 10 out of the 25 top holiday songs on the 2012 Billboard list were written or co-written by Jewish songwriters. This figure includes two versions of “Holly Jolly Christmas,” but does not include “Christmastime is Here.” I guess we have to call that one “an asterisk,” since the original song was co-written by a Jewish lyricist, but the Billboard chart version is the instrumental only. About a month ago, the Idelsohn Society, which (see above) put out the CD of African-American artists singing Jewish songs, issued, “Twas the Night Before Hanukkah: The Musical Battle Between Christmas and the Festival of Lights.” Some of the Hanukkah songs are sung by non-Jewish singers, including Woody Guthrie and Don McLean, and all 16 Christmas songs are sung by Jewish singers. This two disc set is the first-ever history of the duel role of Hanukkah and Christmas music in the 20th century. It’s a musical songbook highlighting both rare and iconic holiday music across both faiths. The 34-tracks feature songs written and performed by Woody Guthrie, The Ramones, Bob Dylan, Dinah Shore, The Klezmatics, Don McLean, Sammy Davis Jr., Mickey Katz, Cantor Yossele Rosenblatt, and many more. The album features our usual extensive liner notes, plus essays from noted critic Greil Marcus and George Washington University historian Jenna Weissman Joselit. You can hear a sample of the music on the InterfaithFamily Network blog. Plaut includes a chapter on the celebration of Hanukkah and Christmas in interfaith families. On November 30, 2012, the book received a mostly favorable review in the NY Times Sunday Book Review. The following video doesn’t show Jews volunteering on Christmas. But it does give an amusing, almost surrealistic view of Jews on Christmas Eve. It was written by three Saturday Night writers: two Jewish; one not. Saturday Night Live recruited Darlene Love to sing this song. For six years, I tried to find more than some skeletal biographical information about Eddie Pola, most famous as the guy who wrote the words for “Most Wonderful Time of the Year.” He managed to surf on top of the troubled waters of the 20th century and live a pretty remarkable and useful life. A year ago, referred by a friend 1, I found a blog entry by a film director 2 that provided some additional information on Pola and links to a short film of him performing in the 1930s. This same friend prodded me to look further; I found a Pola family tree on an ancestry site. I wrote the creator of that tree and it turned out to be Pola’s daughter, who provided me with a short biography of her father. Here is that biography, in edited form, with a little material from other sources. Eddie Pola was born Sidney Edward Pollacsek in New York City on June, 23, 1907. His father was Alexander Pollacsek, born in Debrecen, Hungary; his mother was Ida Friedmann, born in Miskolcz, Debrecen. They were married in a New York City synagogue in 1906. According to Pola’s daughter, Pat Shaw, her father was always a non-practicing Jew. Pola and his parents moved to England in 1913. WWI broke out in 1914 and Pola’s father, still a Hungarian citizen, was considered an enemy alien and was interned by the British government in 1915 (Britain’s main enemies during the war were Germany and the Austro-Hungarian Empire). The internment of Alexander prompted Eddie and his mother to move back to the United States. Not long after WWI ended (Nov.1918), Eddie and his mother moved back to Britain and re-united with Eddie’s father. Eddie Pola completed his education in Great Britain, where his father had achieved some financial success. He graduated in the 1920s from London University with an engineering degree. (Later in life, he would earn a masters’ degree in English.) However, Pola did not pursue engineering as a career. When WWII broke out, in 1939, Eddie Pola and his whole family returned to the United States. During WWII, Pola lived in New York City with his family and, while there, produced several successful radio shows. In 1946, he moved with his wife and two daughters to Southern California, where he produced the Alan Young radio program. (Young, now 93, is most famous as the human co-star of the TV show Mr. Ed). In 1954, Pola was asked to head the Light Entertainment Department for Granada Television; this was the beginning of commercial TV in England. So, once again, Pola and his family moved back to England. He moved back to California in 1962 where he retired and began volunteer teaching creative writing to gifted children, continuing that career when he moved to Oregon in 1994, and eventually teaching the same subject at the local Senior Center in Medford, Oregon. He died in 1995 in Medford, Oregon. He was survived by two daughters, seven grandchildren, and seven great grandchildren. Shaw told me that her father continued to write songs during all these moves back and forth from England to America, and that George Wyle was a long time collaborator. In 1963, they co-wrote “The Most Wonderful Time of the Year.” It was the “B” side of an Andy Williams single record, which had a song about Williams’ daughter (“Noelle”) on the “A” side. Well, the “B” side was the unexpected hit. Pat Shaw added that “Most Wonderful Time of the Year” did not provide the royalties that allowed her father to retire. “Most Wonderful Time” simply added to the investments [Eddie Pola] already had. He had been extremely successful in London in 30s and he was always an intelligent manager of money. He came from a fairly successful family, attended London University and earned a master’s degree in English, and so he capitalized on all those things. Happy Hanukkah, Merry Christmas, and Happy New Year to my readers! My friend, Robert, prodded me to find more on Eddie Pola. A Navy department civilian employee in Maryland, Robert has two “hobby” interests. The first is popular and classical music. The second is the intersection of the Jews and the Chinese. His wife is Chinese and he has a Chinese-American stepson. About a year ago, Robert referred me to a blog entry by film director Raymond De Felitta, entitled, “Who Was Eddie Pola and Why am I Writing About Him?” The whole blog entry is worth reading. But, in short summary, De Felitta recalls how Pola, who never referred to his personal background, selected him and a few other high school students for personal tutoring in creative writing and was a wonderful teacher and a modest guy. De Felitta’s films include the quite moving Thing About My Folks (2005), a film in which the lead character (played by Jewish actor Paul Reiser) needs a bone marrow transplant. He then learns that his Jewish parents are not his birth parents, but that he is the son of an Irish Catholic woman living in Ireland. By the end of the film, he has two loving families, Irish Catholic and Jewish. De Felitta’s other films include Two-Family House and City Island. The latter is a comedy co-starring hot young interfaith actor Ezra Miller. Like Miller, DeFelitta is of interfaith background. His father is of Italian Catholic background and his mother is of Polish Jewish descent.